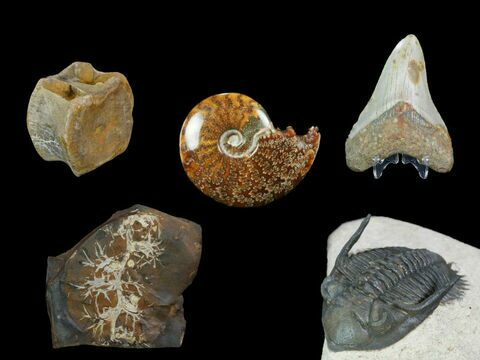 The problem of fake and forged fossils is an ongoing issue both to collectors and academic paleontologists, though it certainly isn’t a new problem. Interest in the prehistoric predator the Mosasaurus has soared due to its prominence in Jurassic World. 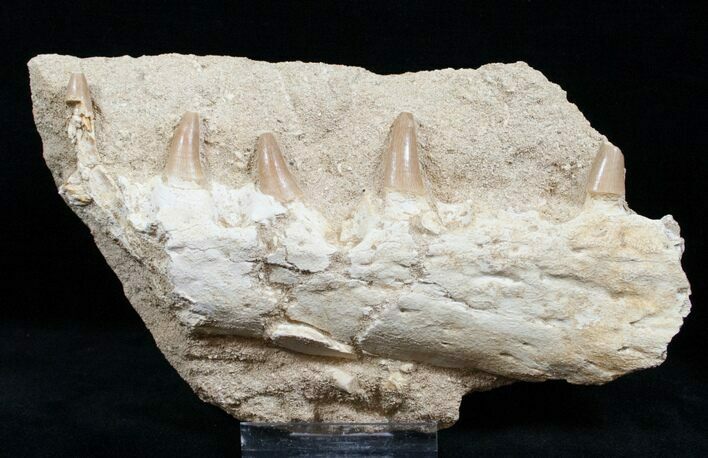 Unfortunately, fake Mosasaurus jaws are one of the most prevalent and widely available forgeries out there. Hundreds of them can be found all over the Internet, Ebay, rock shops, fossil shows, and I’ve even seen them make their way into collections used for educational purposes. Most of the time they are sold as being “authentic”, and I actually think most of the time the sellers don’t even realize they are peddling fakes. 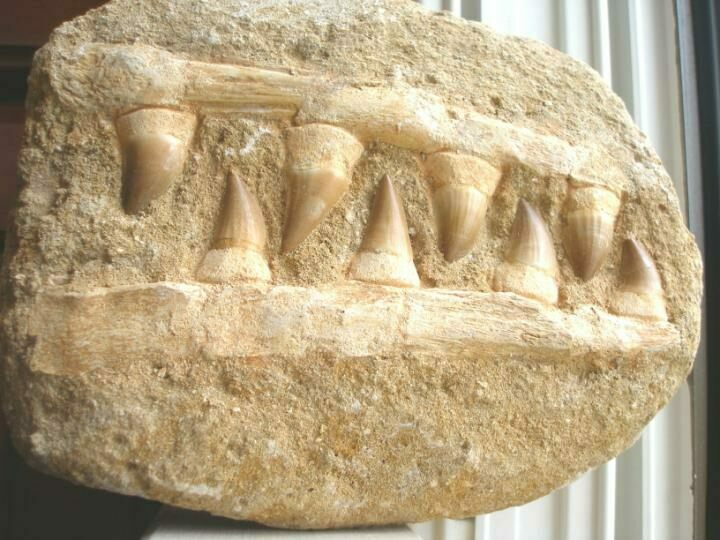 A typical fake Mosasaurus jaw. If you see one that looks like this, run away. 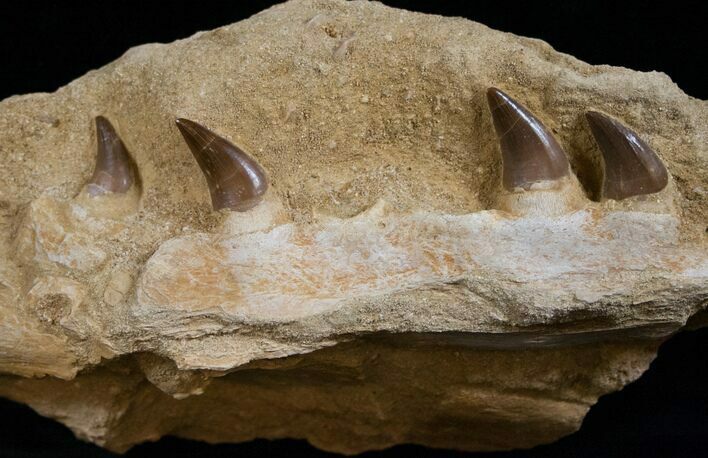 In nearly all the examples the teeth in the jaw are real fossil Mosasaur teeth from the phosphate deposits near Khourigba, Morocco, but everything else isn’t. 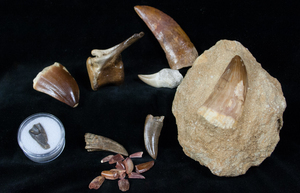 Isolated Mosasaur teeth, particularly the smaller ones (<1 ½”) are actually very common fossils, and huge numbers of them are collected by locals as a byproduct of the massive phosphate mining operations. Jaws and rooted teeth are much more. 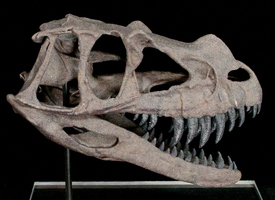 The bone in these fake jaws are typically crudely constructed out of plaster, animal bone, fossil fragments or a combination of the three and mounted in fake matrix. Even in the case of real jaws, the teeth are almost never found in place and must be remounted. In most cases these fake jaws weren’t created to be purposely deceptive. 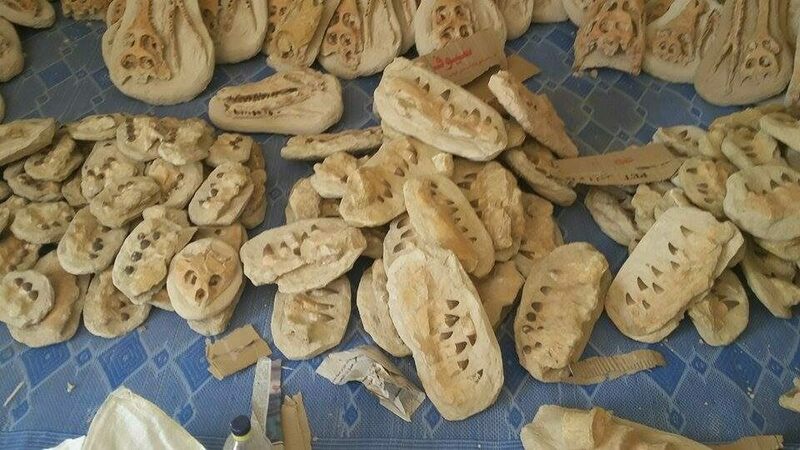 One of the biggest segments of the economy in Morocco is tourism and these fake jaws are mass-produced in workshops as cheap trinkets to sell tourists. Tourists by and large just want something cheap that looks cool to take home as a souvenir. It’s farther down the supply chain where the true nature of these items is lost, either through lack of information of dishonesty by sellers. Fake Mosasaurus jaws in a workshop in Morocco. The crowns of the teeth are real, the rest is fake. Once you’ve seen a few of these fake jaws and what real ones look like picking out most of the completely fake ones visually is pretty easy. They just don’t look right, the bone has no surface detail, isn’t shaped correctly, is all a single shade, the teeth are in the wrong position, etc. It’s the higher end composites out there that can pose much bigger challenge and sometimes it takes more than a visual inspection to root them out. Megalodon vs Mosasaurus: Who would win? 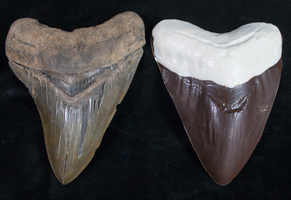 How Are Megalodon Teeth Priced?